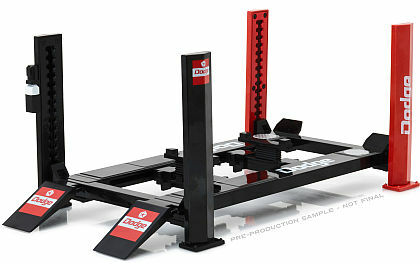 This is the Dodge 4-Post service lift which holds even heavy 1/18 scale model cars in the 'UP' position. 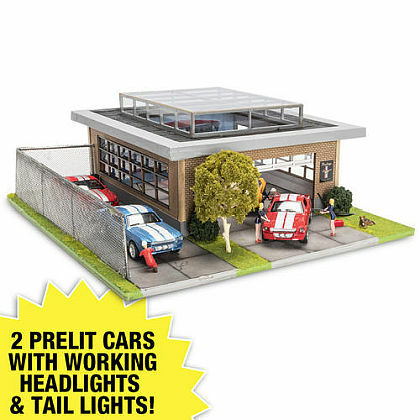 Also cool to ceate your own Garage diorama. Dies ist das beleuchtete "Sally's Mustang Restoration Shop" Diorama inklusive 5 Shelby 1/43 Modellen wovon 2 mit funktionierenden Front- und Rückleuchten aufwarten, sowie allen Figuren und sonstig sichtbarem Zubehör. This is 'Sally's Mustang Restoration Shop' including 5 Shelby cars on which 2 feature illuminated front and taillights, a full array of attendants and lots of further props to hinghlight this outstanding diorama. 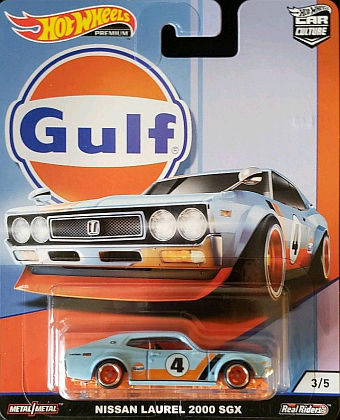 This is the Gulf Nissan Laurel 2000 SGX #4 from Hot Wheels Car Culture line from its GULF release. 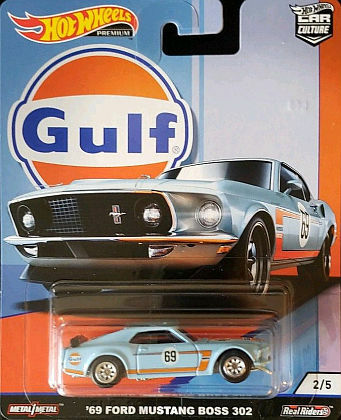 This is the Gulf 1969 Ford Mustang Boss 302 #69 from Hot Wheels Car Culture line from its GULF release. 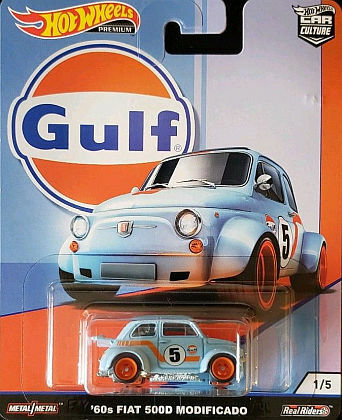 This is the Gulf Fiat 500D Modificado #5 from Hot Wheels Car Culture line from its GULF release. This is the 1970 Plymouth Trans Am Barracuda street version in matte black a really sinister looking car with all opening features. 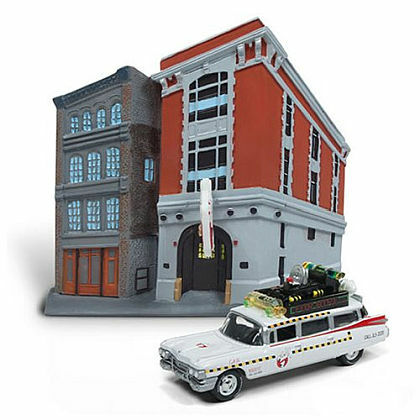 This is the 'Ghostbusters Headquarters' diorama Facade including ETCO-1A 1959 Cadillac. 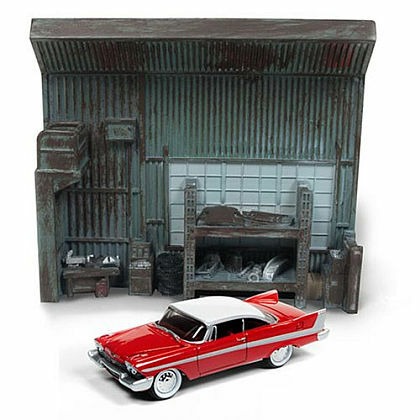 This is the Hit movie 'Christine' diorama including Darell's Garage and 1958 Plymouth Fury acting as 'Christine'. Dies ist das "Scheunen Fund" Diorama inklusive Scheunen Fassade und 1968 BULLITT (?) Ford Mustag GT 390 in Highland Grün mit Motorhaube zum öffnen. 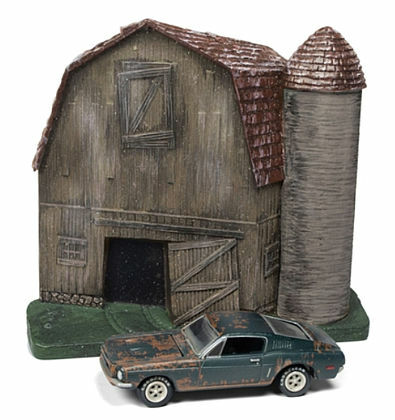 This is the 'Barn Find / Lost Legends' diorama including Barn Facade and Highland green 1968 BULLITT (?) Ford Mustang GT 390 with hood to open. 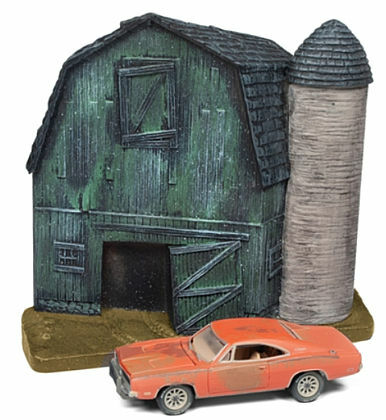 This is the 'Barn Find / Lost Legends' diorama including Barn Facade and orange 1969 Dodge Charger just been pulled out of hibernation. 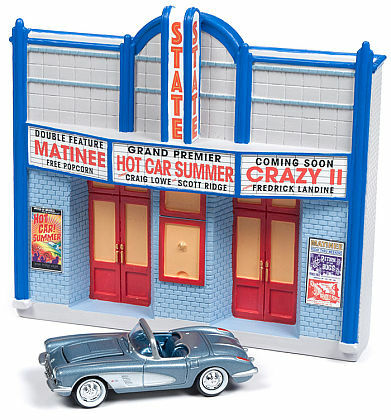 This is the Movie Theatre Façade Diorama including 1958 Chevrolet Corvette convertible in silverblue with white cove and hood to open. 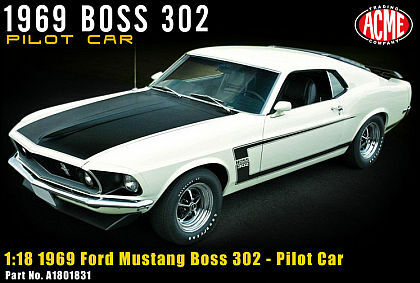 This is the very first built 1969 Ford Mustang Boss 302 also known as 'Pilot Car'. Ford tested with the build of this car all processes along its assemly line. 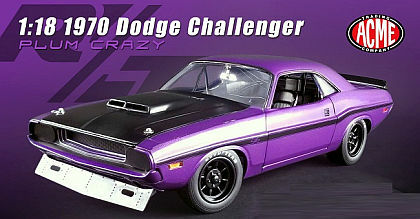 Dies ist der Dodge Challenger T/A von 1970 in "Plum Crazy Purple" mit schwarzer Motorhaube, schwarzen Felgen, Front- und Heckspoiler. This is the 1970 Dodge Challenger T/A in factory correct Plum Crazy Purple color with black shaker hood, front air dam and black trunk mounted rear wing, black alloy wheels. Limited Edition of 480 pieces only. 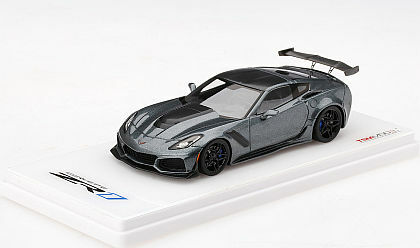 This is the C7 Corvette ZR1 Coupe in factory correct Dark Shadow Grey with carbon hood insert, carbon roof panel and carbon rear wing. Blue brake calipers with white 'CORVETTE' lettring and black alloy wheels with black wall tires. 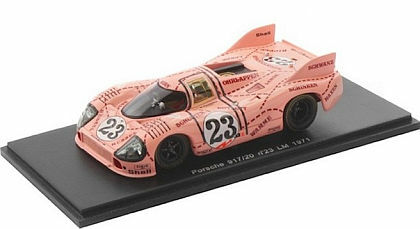 This is the dirty version of the Porsche 917/20 #23 as entered for the 24-Hours of Le Mans 1971 by Martini Racing. This car is better known under its 'Pink Pig' name. This is the Porsche 911 RSR #92 as eneterd by Porsche GT Team for the Le Mans 24-Hours 2018. This is the new version of the famous 'Pink Pig from 1971. 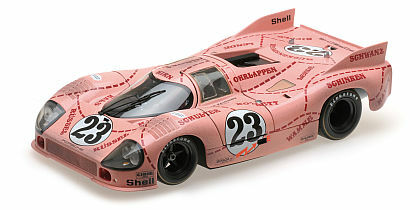 This is the Porsche 917/20 #23 as entered for the 24-Hours of Le Mans 1971 by Martini Racing. This car is better known under its 'Pink Pig' name. 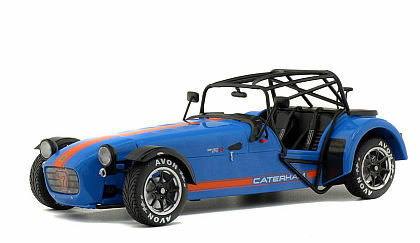 This is the Gulf colors inspierd Caterham 275R featuring black roll cage, chrome side exhaust, alloy wheels with Avon tires. 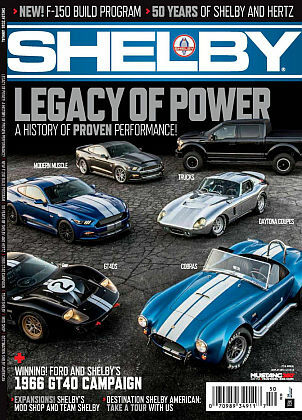 This is the 2016 Shelby Annual Magazine. This is a 'must-have' for any true Shelby enthusiast. 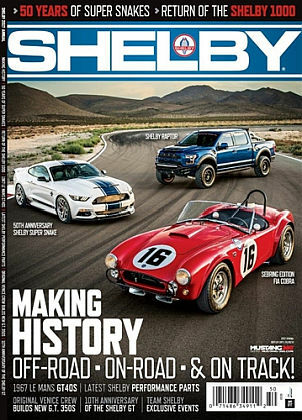 This is the 2017 Shelby Annual Magazine. 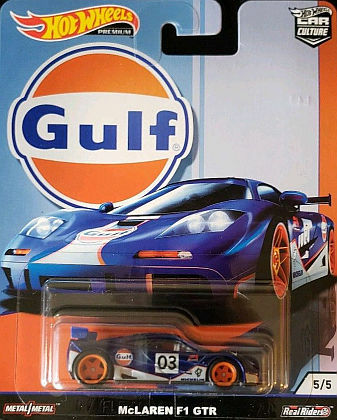 This is a 'must-have' for any true Shelby enthusiast.